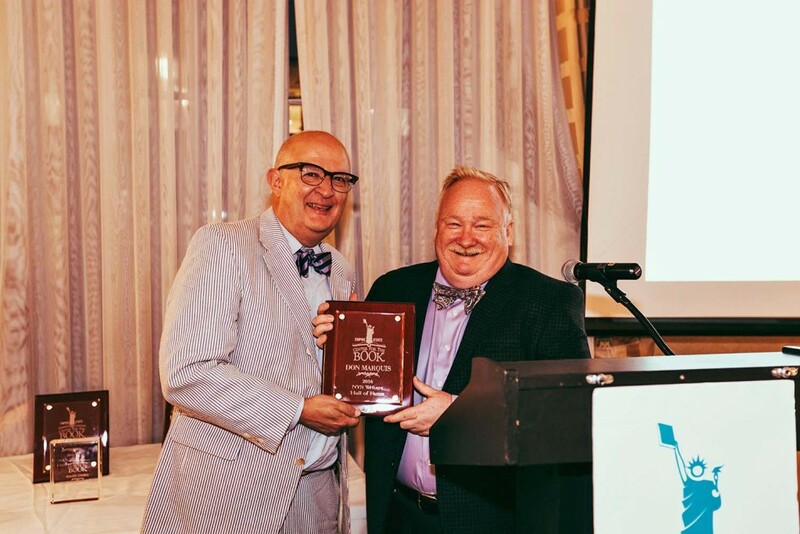 It was a thrilling night at Manhattan’s 3 West Club on Tuesday, June 7, as Don Marquis and seven other literary greats were inducted into the New York State Writers Hall of Fame at a gala dinner hosted by the Empire State Center for the Book and the New York Library Association. Don joined Roger Angell, Roz Chast, Samuel R. Delany, Stephen Sondheim, Maya Angelou, Jean Craighead George, and Grace Paley as 2016 honorees. Sixty-six writers have been inducted into the Hall of Fame since its founding in 2010 by the Empire State Center for the Book, including Walt Whitman, Herman Melville, Washington Irving and Frederick Douglass. Twentieth-century writers in the Hall of Fame include John Cheever, Toni Morrison, E.B. White, Dorothy Parker, James Thurber, Kurt Vonnegut, Nora Ephron, Calvin Trillin and Joyce Carol Oates. He was right, of course. “archy and mehitabel” — his lowercase stories of a cockroach with the soul of a poet and an alley cat dancing through her ninth life — remains a classic of American literature. The book has never been out of print since it first appeared in 1927 – more than 100 printings, by my count — and its stories are in virtually every anthology of American humor. Not his five novels, not his three volumes of serious poetry, or his four Broadway plays – 29 books in all. And that’s not counting the four Hollywood movies and five radio and television dramas based on his work. 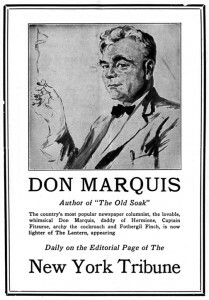 No, we know Don Marquis best for “archy and mehitabel” – wild bits of fantasy that helped make him one of the most famous writers in America in the years before and after World War One – before the wits of the Algonquin Round Table and the New Yorker magazine gained prominence, and before the writers of the Lost Generation found their voice. Archy and Mehitabel, by the way, were first conceived just over 100 years ago – in March, 1916 – to fill space in Don’s six-day-a-week newspaper column in the New York Evening Sun. Filler material has never had such staying power. But I’m certain Don would be extremely proud to accept this honor. Every journalist dreams of being remembered for something more than yesterday’s headline and tomorrow’s fishwrap. In Don’s case, the successful comic, the beloved humor writer always wanted to be taken seriously. Sadly, Don Marquis has no family left to claim this Hall of Fame honor. Both of his wives and both of his children died before his own passing in 1937. Don’s stepson, Walter Vonnegut Jr. – a cousin of Kurt Vonnegut, by the way – died three years ago at the age of 90. Me, I’m a stand-in. I am wrapping up work on a bibliography of Don’s writings, and I edit a website and a Facebook page that reprint some of his tall tales and light verse and tell stories about his life. 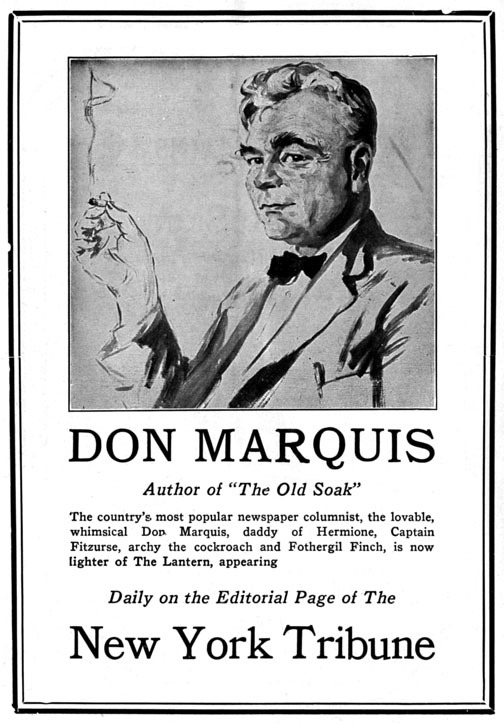 To most Americans of the 1920s and ‘30s, Don Marquis was the consummate New Yorker – suave, clever and successful. But Don was born and raised on the Illinois prairie. He arrived in New York in 1909 and got his first solid job in New York on the staff of the Brooklyn Eagle, a storied newspaper that had once employed another future member of the New York State Writers Hall of Fame – Walt Whitman. After a year Don left the Eagle to make a name for himself on the New York Evening Sun, where he created his famous characters Archy and Mehitabel, along with The Old Soak, and Hermione and her Little Group of Serious Thinkers. Don’s last newspaper job was at the New York Herald Tribune, working out of its offices at 219 West 40th Street. Today that building is the home of the CUNY Graduate School of Journalism. I don’t know for sure if there are any ink-stained ghosts in the CUNY classrooms, but I do know that Don Marquis always warmly regarded his colleagues in that building. And so it seems appropriate that Don’s Hall of Fame award find a home there. I’d like to introduce Andrew Mendelson, associate dean of the graduate school of journalism, and Tim Harper, adjunct professor and editor of the CUNY Journalism Press. I talked with Dean Mendelson, and he told me that the school would provide a home for this award there on West 40th Street. By doing so, they will make one old ghost very, very happy. Thank you very much. Rocco Staino, left, and John Batteiger with Don Marquis’s Hall of Fame award.